Every few years Hollywood whips up a prestige musical that will, if nothing else, help liven up that year’s Oscar broadcast. Following in the footsteps of Into The Woods, Les Misérables, and Sweeney Todd, the next musical to get the big-screen treatment will be Oliver!, the cheery adaptation of Charles Dickens’ Oliver Twist. Unlike those previous musical ventures, however, this will be a remake: After debuting on the West End in 1960, the Lionel Bart-penned show was adapted into an Oscar-winning movie in 1968. It’s still very early days for this new adaptation, as Variety reports rights deals are still being completed and the project won’t officially be greenlit for a few weeks. However, Jonathan Strange And Mr. Norrell director Toby Haynes is already expected to helm the film. Haynes is mostly known for directing episodes of big budget British TV shows like Sherlock and Doctor Who, but he’ll be backed by prolific musical theater titan Cameron Mackintosh, who is producing Oliver! along with Working Title and Sony Pictures. This new adaptation will reportedly be “grittier than the original,” which should be interesting since a lot of the songs are rather upbeat and peppy. 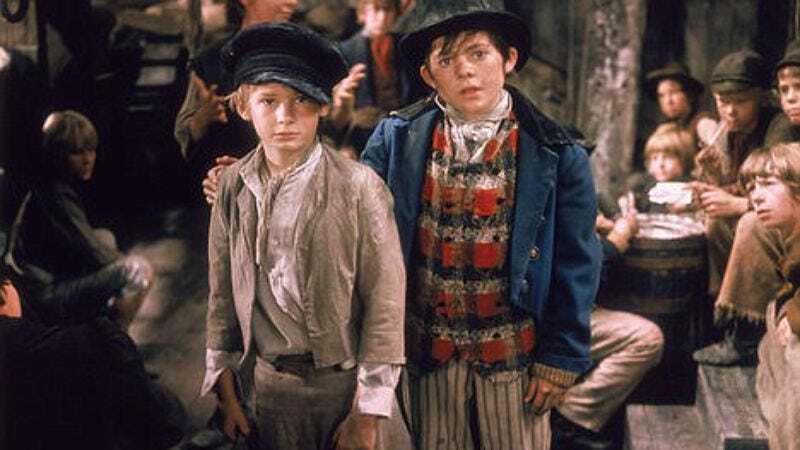 Casting is currently underway, with a particular focus being paid to the lead roles of naïve orphan Oliver Twist and charming pickpocket The Artful Dodger. As an unnamed executive explains, “I don’t care if Jennifer Lawrence is cast as Nancy and Leonardo DiCaprio as Bill Sikes — no film of Oliver! will work without the right kids to play Oliver and Dodger.” That real-life J. Jonah Jameson is in luck, as young British boys are in vogue at the moment. Haynes might consider reaching out to that kid from Pan, any number of those rejected Spider-Man contenders, or whoever just aged out of Billy Elliot The Musical.